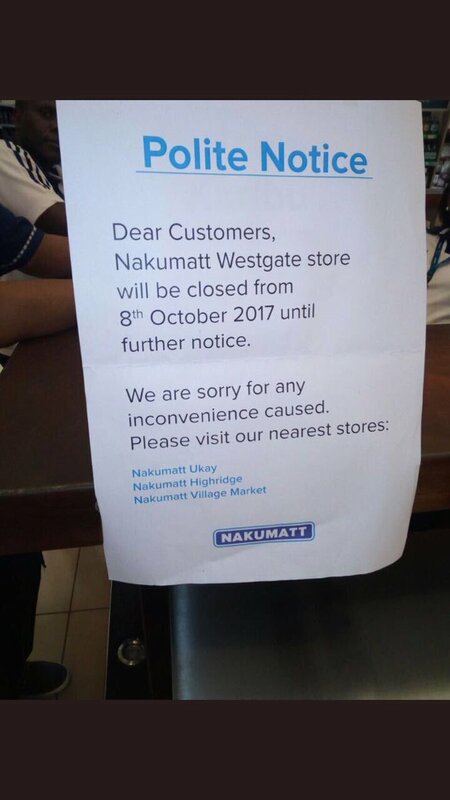 Nakumatt won't stop purging its branches and the one at Westgate Shopping Mall is the latest victim. Shoppers were given a notice on Saturday that the store would be closed from 8th of October until further notice. It is not lost on many that Nakumatt Westgate was the store with the highest turnover in the chain due to its strategic location in Westlands. Nakumatt Westgate went through a rough patch sometimes back when terrorists stormed the mall and people died apart from property being damaged. Since Nakumatt was the anchor tenant in the mall, it was obviously the biggest loser in the disaster. Soldiers from the Kenya Defense Forces were also caught on camera helping themselves to the cash in the supermarket. Many had expected that the merger deal signed between Nakumatt and Tuskys would save the remaining branches but that seems not to be the case. Nakumatt TRM, Nakumatt Junction and Nakumatt Greenspan are some of the branches that have already been closed. Customers have been advised to visit Nakumatt Ukay, Nakumatt Highridge and Nakumatt Village Market. It might only be a matter of time before these branches face the same fate too.